My name is Amanda Gobatto and I am the founder of Digital Girl Consulting. I love to read and learn about other entrepreneur’s journeys so I thought this would be the best time to share mine, in my first blog post. This is my journey: my real, raw and honest journey to how I landed to where I am now, wearing three business hats. From the time I was a young child, the path towards a career that was in my head was that I would be a teacher. I always have loved young children and teachers run in my family, so it made sense. There were a few times that I would entertain a different career choice for a minute, and I would ALWAYS go back to wanting to become a teacher. So, become a teacher is what I did. However, I remember my Dad (who was an educator as well) often having conversations with me about teachers who later went on to become entrepreneurs or corporate trainers and this ALWAYS intrigued me. Apparently those conversations were locked into my mind more than I realized at the time. As an aside, and definitely not a a minor one, I have always enjoyed technology. I remember being in elementary school and my father bringing home the latest computer home from his school. His task was to learn how to use it, and I always ended up being the one to figure it out first and teaching him. I became that “go to” person when people needed to learn how to do something on a computer. The steps in my journey began earlier than I realized. I loved teaching. It consumed me, in a good way. However, another dream that I had always had was to be a stay at home Mom when I had children. I will forever be grateful for the opportunity to be at home with my children when they were young. To this day, I continue to be grateful that I have a flexible job that allows me to be home for them when they need me. I became a blogger the year that my daughter was born. 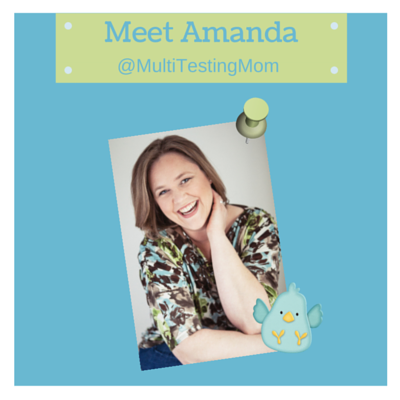 My blog, Multi-Testing Mommy grew into what it is today slowly. A blog that was intended to be an online diary ended up being a blog where I was sharing information, recipes and gift ideas with Canadian Moms. Through my blog, I have had the incredible experience of working with entrepeneurs all the way to corporate, big brand names. I also communicate with advertising agencies and PR agencies on a regular basis. I started helping the small to medium businesses in the online aspects of their business very early on. HELPING being the key word. It wasn’t until one of the entrepreneurs made the decision that she needed me on her team that I officially was WORKING with business owners with the online aspects of their business. As a blogger, I have also had the experience of working on various social media, experiencing how to optimize and leverage social media in order to grow a brand over the past 13 years. My teaching career, specializing in technology along with my patience and passion for educating and helping people has led me to the career I have chosen for myself today as an entrepreneur with Digital Girl Consulting. I will also add that I continue to have experience in the Direct Sales world as a Norwex Independent Sales Consultant. Through this experience, as well as having spent a year on the Social Media Advisory Council with Norwex, I have learned the ins and outs of promoting a direct sales business using the online space. Many of my Digital Girl clients appreciate the fact that I can also view business through the lens of a direct sales business. Digital Girl is now my main focus, working with heart-centered, joy seeking, success driven entrepreneurs to grow and expand their business using the online space. Thank you for reading, if you made it to the end. I realize that this post was all about me, but it seemed like the best place to start as I launch this blog too. This will be the fourth blog that I have launched under my name and I am excited to use it as a place to share my knowledge of the online space with business owners like you! I so enjoyed learning more about you and how you got started! I’ve had 2 blogs, both of which were very successful. My first was sharing personal stories of my journey out of abuse and walking my mom through her cancer journey, the second was a cookbook review blog. I love to write and everyone always tells me I’m a great storyteller! I stopped both blogs after I had my kids because I didn’t have the time or energy to put into them even though there was demand for it, especially the cookbook blog. I knew I needed to do something with myself after the second child came along and I got really lonely and drained from the kids so I joined Norwex! I love it and take it very seriously! I’ve always secretly wanted to get back into blogging but don’t know what to write about now, lol! It’s truly amazing what happens and changes when we become mothers! Thank you for sharing that, I never knew that about you, Sarah. Look at how far you have come. Perhaps you will be motivated one day to share a new type of story in the future. Interesting story, Amanda. Thanks for sharing. I knew about your teaching background but not how you came into the digital world. You could add that you are an excellent photographer as well! Thank you for reading, Carol. Your comment is very thoughtful and kind – I do love photography and today I needed to hear that as I go into a photo shoot – your words lifted me up. Thank you! Having had the opportunity to work closely with you, I can honestly say that you add value to every project you work on and every person you “teach”.Your capacity to share and your breadth of knowledge never cease to amaze me. Thank you for creating another space for us to experience more! Rachel – thank you for your kind and thoughtful words- you fill my bucket and I appreciate the opportunity to work closely with you every chance I get. I learn a lot from you too! Learning and growing together as entrepreneurs is key!